Elderly pets can be particularly good choices for older people. Happy little Papillion Nicky is 16 years old. He ended up at PAWS Chicago after his owner died and the man’s wife, who had two other dogs, could not take all three to her new condo. Nicky was adopted by Ed, a widower in his 80s who lives in Des Plaines. Ed has always loved dogs. He went to several shelters and kept hearing that he was too old for a new dog. However, his daughter heard that PAWS Chicago had a program for senior citizens wanting to adopt pets, and that’s where he found Nicky. Adopters frequently think about younger dogs who need a lot of activity and upkeep. But Ed and his daughter had a different perspective, and had an immediate connection with Nicky. The two seniors are enjoying growing older together and keeping each other company. Nicky has three dog beds, but sleeps next to Ed. They love to take walks and Nicky can’t wait for Ed to watch TV so he can jump up right next to him on the couch. Since 2006, PAWS has worked with the national Pets for the Elderly Foundation, which was founded to provide companions to senior adopters and save homeless animals. Through the first quarter of this year, the program has helped to place more than 66,000 animals nationally with seniors, and currently has 47 participating shelters in 26 states. The organization underwrites a portion of adoption fees for senior citizens. 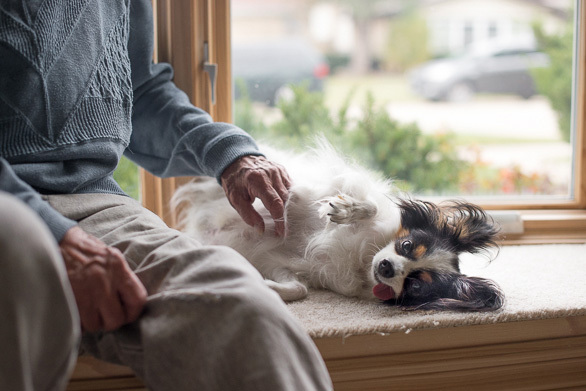 Research shows that pets help with the physical, emotional and social issues facing many seniors, according to Pets’ Executive Director Susan Kurowski. Owning an animal results in improvement in medical conditions like blood pressure. “Emotionally, there is an easing of loneliness, as well as the feeling that ‘someone’ is counting on you to care for yourself and them. Also, particularly for dog adopters, there is a reduction in isolation, as many walk around the community and reach out to others,” Kurowski says. Kurowski notes that the biggest concerns she hears about, usually from people who are not seniors themselves, are whether older people have the ability to afford an animal on a fixed income, the physical capacity to keep up with the pet, as well as what will happen to the animal when the owner dies. Kurowski responds that 90 percent of adoptions to seniors are to people in their 60s and 70s–not very old by today’s standards. And while the affordability of pet care is always a concern, most seniors are aware of their budgets and know what can be fit into their plan. PAWS Chicago recently started an initiative to bring together senior pets with senior adopters. The Seniors for Seniors program will include PAWS presentations at senior living and retirement facilities, focused on the advantages of fostering and adopting senior pets. Elderly dogs and our love for them are being showcased in a new book, Unconditional: Older Dogs, Deeper Love, by acclaimed photographer Jane Sobel Klonsky. The book, published by National Geographic, will be available in the fall but can be pre-ordered now online. Information about the book and photographs from Klonsky’s Unconditional series can be found at projectunconditional.info. A number of PAWS alumni including Nicky are featured in the project.